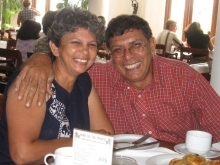 Early in 2004 Olivia, Kathleen's sixth child, and her husband Fred left Australia to live in Sri Lanka to fulfil Kathleen's dream of helping the people there. Olly and Fred have three adult children and four grand children in Australia. During their time in Sri Lanka, Olly and Fred have faced many challenges, but keep firm on their path to achieving their goals.